Eight managers have already hopped their hessian bags over the finish line this season, but that doesn’t mean the Premier League sack race isn’t as hotly contested as ever. 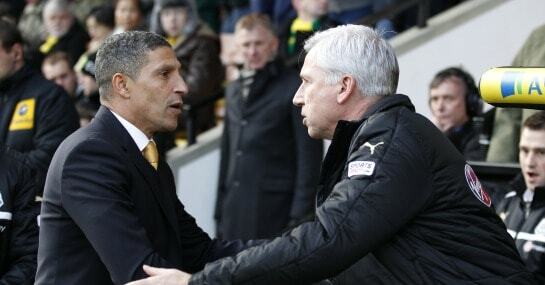 Sunday’s helping of top-flight action could be pivotal in the future working lives of two men taking to the dugout, with negative results thought to be enough to bring the curtain down on one or both of Chris Hughton and Alan Pardew’s jobs. Hughton’s Norwich are one point above the relegation zone going into their home match against Tottenham and have won just once in the last 13 games in all competitions. He is the 11/10 favourite to be the next to finish the race. Having never been far away from the skinny end of the “next manager to leave” betting, despite improving on Paul Lambert’s work last season with an 11th place finish, it’s thought that defeat to the Lilywhites at Carrow Road will earn him the boot as Canaries boss. The suited and booted clan at the Norfolk club are keen to bring Neil Lennon in to marshal the sidelines in Hughton’s place and even went as far as to admit publically that replacements were being considered should the former Newcastle boss cop it. Pardew’s collection of four points from the last 24 available make him the 5/1 second favourite for the chop and admitted prior to his battle with Lambert’s Aston Villa that the thought of receiving his P45 worries him. It’s been the form at home that’s particularly loosened Pardew’s grip on the Newcastle reigns, where his side have lost five on the bounce in all competitions, scoring just one goal.